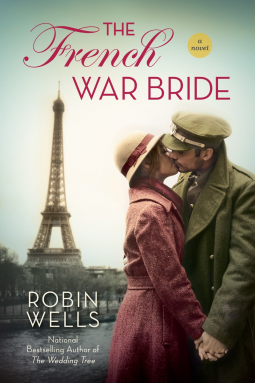 Amelie Michaud is sixteen and living a happy life in Paris when World War II starts. At first little seems to happen, even with her brothers going off to join the army, but then little troubles become big troubles and finally major hardship. Amelie and her best friend, Yvette, wind up on their own in Paris, working menial jobs to survive, and spying for the Resistance. Meanwhile, we have the frame story--Amelie O'Connor, seventy years later, likes to keep the door to her little apartment at her assisted living facility open, to receive visitors. One day she receives a very unexpected visitor--Kat Thompson, former fiancée of her late husband, Jack O'Connor. Kat has never gotten over resenting the fact that her fiancé came home with a French war bride. Now that she's dying of cancer, her hospice counselor says she needs to forgive for her own peace of mind, and her minister tells her she needs to forgive for the sake of her own soul. So now, she wants the story of what happened between Amelie and Jack. Right now. Amelie agrees to tell her, but in her own way, which involves telling her experiences through the whole war, while Kat doesn't see why anything prior to Amelie meeting Jack can possibly be relevant to what she wants to know. Kat, it turns out, has very definite ideas about what must have happened. Amelie recounts the story of the increasing hardships and terrors of the war years, as she and Yvette slowly lose their entire families, and need more and more desperate measures to survive, while taking greater and greater risks to support the Resistance and help defeat the Germans. They each lose their first loves, struggle to get enough food while the German occupiers eat in a meal what an entire French family needs to make last a week. It's near the end of the war when Amelie meets Jack, and the truth of what happened challenges Kat's assumptions, and challenges her view of herself. Both the historical background, and the personality development, including the relatively tricky on of Kat, are well-handled.